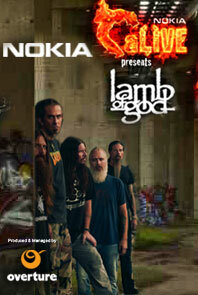 “Lamb of God” the American heavy metal rock band is visiting India as part of the “Resolution Tour 2012”. 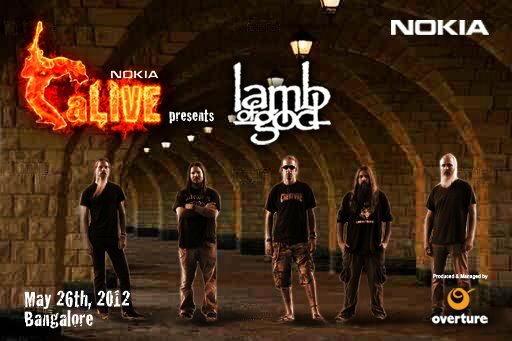 The metal band is starting their tour with a concert to be held on 26 May 2012 in Bengaluru (Bangalore) and presented by Nokia, India. The band will perform popular numbers from their recent album called “Resolution”. Resolution was the sixth Album Lamb of God has released on 24th January 2012 under the label Roadrunner Records. In India, a crowd of almost 7,000 people attended their previous show which was held at Palace Grounds, Bangalore by Rolling Stone, India. India has a huge fan base for this 2 time Grammy nominees and fans are eagerly waiting for this return visit. The show will start at 4:00 PM (IST) on May 26, 2012 and will last for almost 8 hours. The venue for this show is yet to be declared by the organiser, Overture, but will be around Bangalore, India. Overture is based out of Bangalore, India and is one of the best known in Live Entertainment industry. Their recent event called the Summerstorm Festival has been a big hit, attended by almost 15,000 people in two editions. Tickets are available online at Bookmyshow.com for Rs.1,250 (as of 26th April 2012). Please note this is a early bird price offered on the site and prices are bound to increase looking at the popularity of this band. Watch this space for more details about the exact location of the show. If you have any questions or wish to share more information about the band or the show, leave your comments below.